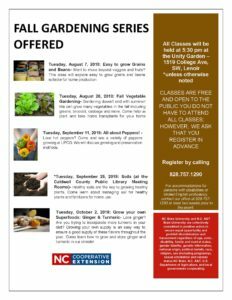 2018 Fall Gardening Series Offered! Tuesday, August 7, 2018: Easy to grow Grains and Beans- Want to move beyond veggies and fruits? This class will explore easy to grow grains and beans suitable for home production. Tuesday, August 28, 2018: Fall Vegetable Gardening- Gardening doesn’t end with summer! We can grow many vegetables in the fall including greens, broccoli, cabbage and more. Come help us plant and take home transplants for your home garden! Tuesday, September 11, 2018: All about Peppers! – Love hot peppers? Come and see a variety of peppers growing at UPCG. We will discuss growing and preservation methods. *Tuesday, September 25, 2018: Soils (at the Caldwell County Public Library Meeting Rooms)- Healthy soils are the key to growing healthy plants. Come learn about managing soil for healthy plants and fertilizers for home use. Tuesday, October 2, 2018: Grow your own Superfoods: Ginger & Turmeric- Love ginger? Are you trying to incorporate more turmeric in your diet? Growing your own supply is an easy way to ensure a good supply of these flavors throughout the year. Come learn how to grow and store ginger and turmeric in our climate!